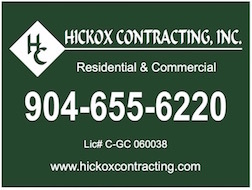 Welcome to Hickox Contracting, Inc., a full-service company that provides commercial and residential contracting services in the Jacksonville, Florida area. We also are fully equipped to handle your remodeling needs. We've been in business for more than 20 years and survived the recent construction downturn for a reason -- our customers trust us and come back time and time again for their contracting needs. Please take a moment to lean more about our services and our company by visiting the various sections in our website.